You know "baldness, can be reversed".. I used, to have a bald spot. Now, I look like an hairy overfed chia pet. You use it as a "pre rinse", wet your hair with it, for a few minutes, before you shower. Baldness, is caused by waxy DHT residue, at the base of each hair. Which causes baldness. That's why all bald people have "a shiny head", that's wax. And only vinegar, can dissolve it. Soap, does very little, on this wax..
Apple cider vinegar, dissolves it, as well as unclogging the sebum blackhead type clogged hair follicles..
Just like when your coffee pot is clogged. What, do you do? "You run vinegar through it", to dissolved, all the stubborn hard water deposits, plugging the pot. If, it can dissolve "something as hard as rocks"?, it certainly can dissolve follicle clogging scalp wax..
Vinegar, is "the strongest natural safe acid, you can apply to your skin". And that, is only if you dilute it, 50/50. Don't, dilute it? "Your skin will get red", for a spell. And, you wont do that again. It has to be diluted, to be safe. Now, this is where the miracle comes in.. Your dear Shekinah loves you, I'll tell you that. The vinegar, "has to be diluted", anyway. 50%, as the acid within it, is too strong, to use it straight. What, did your dear God cut it with? 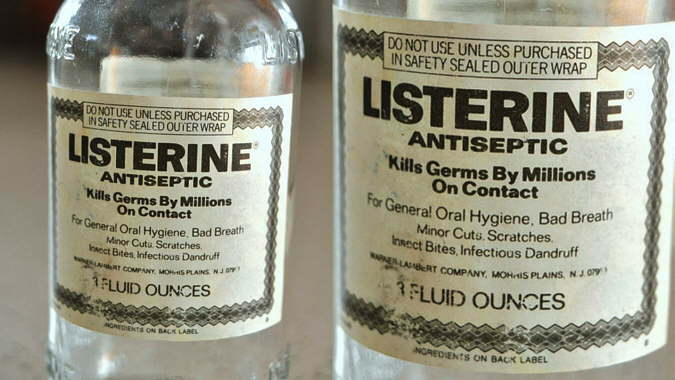 Listerine, and Listerine, it is not commonly known, was marketed early on as also "a Dandruff cure". The alcohol within it, kills all the dandruff bacteria..
And Dandruff bacteria, makes you go very bald, also. 2 birds. With one stone.. I, would call that a miracle! And so it's called, "Miracle Hair Tonic"..
You take your little squirt bottle into the shower and squirt the tonic onto your dry hair, massage it in, and wait for a few minutes. Then, shampoo and shower as normal. Like weeds after a rainstorm..
How do you tell, your hair is coming back? If it takes, about 4 months? "Count the hairs in your comb", after you shower. The hair count, will fall 2/3rds, at least. To about none. No hair in the comb! After showering. That, is refreshing. It seems, the weak roots, just start getting stronger. You naturally lose, about 80 hairs a day, they say. But, the more in your comb? The more, you're developing a bald spot. The less, in your comb? The more, your bald spot is reversing. And filling in. And Shekinah's miracle hair tonic will drop the count down to 1 or 2. Or zero. Will be your counts..